Sydney Plumbing Services » What’s My Pee Telling Me? We all pee daily, usually without giving it a second thought! Unless we get an unexpected sensation when the bladder passes urine. Is your pee Mellow Yellow or does it look like Vitamin Water? What’s my pee telling me? is a hilarious little book that will make you giggle, with its uncensored urology education that might even make you laugh out loud or even pee your pants! You will learn why your pee is clear, yellow or frothy. Or when it’s very warmer than usual, smelly or looks like rum? Inside What’s my pee telling me? Dr. Anish Sheth reveals how to identify what comes out of your bladder and how that may be the KEY to your happiness and health. Most importantly, your pee reveals your body’s internal plumbing. 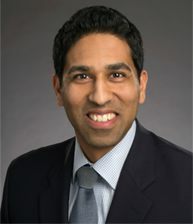 Dr. Anish Sheth is a scientist and a doctor. He is currently an attending physician at the University Medical Center at Princeton University and a member of the American Gastroenterology Association; he also knows stuff about urology. What’s my pee telling me? takes a light humorous approach to teaching the rest of us about some head-spinning scientific facts that you’d need a medical dictionary and several months off work to understand. Have you heard about ileum, jejunum, and duodenum? Neither have we! That’s why you need What’s my pee telling me? 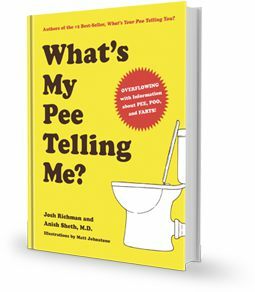 You will learn more about pee in a single reading than most people learn in their lifetime, without being assaulted with irritating medical jargon.